Final score Kopiko – 1 and Great Taste – 4, so overall the product wasn’t what I expect it to be. Unlike the other coffee variants I’ve tried, claiming to be White Coffee means you have to have more milk than the usual boldness of coffee that instant coffee offers. A friend of mine said it was too sweet. I didn’t find it sweet yet again I could always try prepare it and see where my friend was coming from. Great Taste™ White Coffee still comes out the top in the White Coffeemix category. Congratulations! 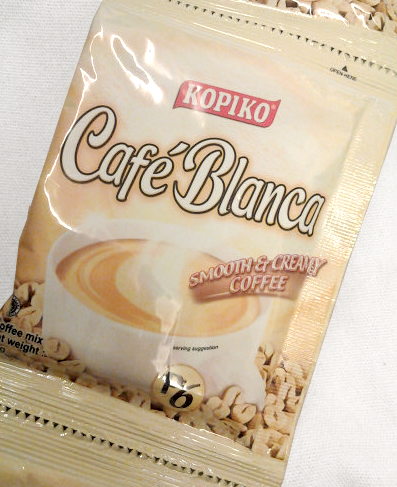 After their successful Kopiko Black and Brown 3-in-1 coffee mixes, Pt Torabika Eka Semesta of Indonesia who introduced this to coffee-crazed Filipinos is now introducing a White variant called CafeBlanca. If I know any better, this one is out to challenge the other White Coffee 3-in-1 mix that is hogging this segment right now, Great Taste White Coffee (by Universal Robina Corporation). Incidentally, Kopiko’s White Coffee brand is known outside The Philippines but Great Taste beat them to the punch so now they have to introduce a new name for it — CafeBlanca. We saw this variant today and my verdict? Well, just wait for it tomorrow as we reveal who I think will grab the limelight. For now, try to grab this coffee sachets at your favorite grocery, supermarket, or even wholesale stores today. You saw it first here in New In The Market!